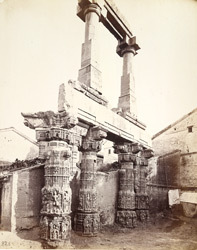 Photograph of four great pillars and architrave of the ruined Rudra Mahalaya Temple at Sidhpur in Gujarat, taken by Henry Cousens in the 1880s, from the Archaeological Survey of India Collections. The Rudra Mahalaya Temple dates from the 12th century and was constructed by the Solanki ruler Jayasimha (r.1094-1143). This multi-storeyed temple is devoted to the Shiva, a principle Hindu deity, and once consisted of eleven shrines and three gateways, although only some fragments remain. The ornamentation of the temple was exuberant as shown by the the elaborate and detailed carving of the pillars in this view.